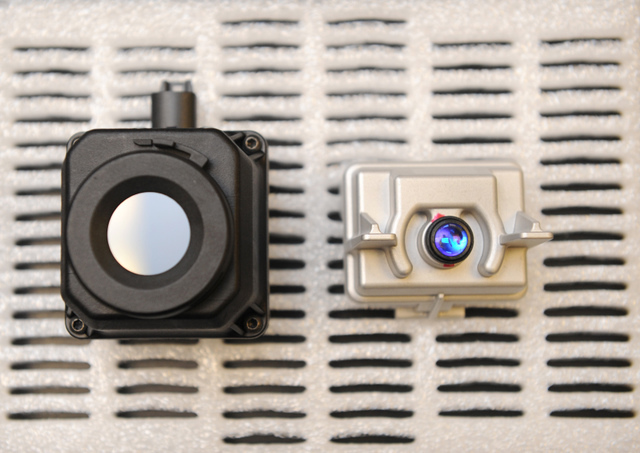 Tucked into a nondescript South Fairview office complex just around the corner from Old Town Goleta and a stone’s throw from the Santa Barbara Airport is a small but busy workshop that makes more infrared cameras than any other facility in the world. This is the headquarters of Autoliv Electronics Night Vision, an arm of an $8.6 billion automotive safety company that has designed and manufactured seatbelts and airbags since 1953. Today, the company is also building infrared systems to help drivers see better at night and avoid hitting people and animals on the road. Last month, the Stockholm-based Autoliv, which has been installing such systems since 2005 and added a pedestrian recognition feature in 2008, launched a third generation that is able to detect deer and other four-legged animals should they wander into the path of an oncoming car. The first creation of its kind, said managing director Stuart Klapper, it reflects the shift in industry focus from “passive safety” (making an accident survivable) to “active safety” (preventing accidents altogether). Right now, the new version is only fitted on the 2014 Mercedes S-class but will be incorporated into other makes and models in the coming months. Every year, explained Klapper, there are about 1.1 million deer/car accidents in the U.S. that cause more than 25,000 injuries and result in $3.5 billion in damages. While those of us in California have a relatively small likelihood of hitting one of the hoofed hazards (a 1 in 1,116 chance) residents of states like West Virginia and Iowa — 1 in 53 chance and 1 in 77 chance, respectively — are much more familiar with the risk. So for the last six years, Klapper’s team have been collecting data from road trips, safaris, and visits to deer farms to develop “extraction and classification algorithms.” In other words, technicians have been teaching the camera’s computer systems, which are unique to every make of car, to analyze a 24-degree-wide swath of the road every 33 milliseconds in order to spot humans and four-legged animals while disregarding other objects of similar size and shape. The result is a video display in the dashboard that pinpoints and highlights heat-emitting animals up to 160 yards ahead — drivers typically can’t see beyond 40 yards — and gives the person behind the wheel two to four seconds of reaction time to avoid them. The sharp visuals — powered by sensors from FLIR Technologies, another Goleta company — look and feel almost military grade. Made of 15 parts and fitted together in a sterile, static-free production line that’s as fast as it is efficient — Klapper’s 41 employees, who all live on the Central Coast, churn out 300,000 units a year — the cameras are equipped with a small defroster and are set behind an opaque disk of germanium metal since glass conducts heat. Luckily, dirt and bugs have little effect on its sightline, but there’s also a small water jet to keep the lens window grime-free. Figuring out where to install the cameras on the front of cars is one of the more difficult aspects of the job, Klapper went on, so Autoliv works with car company stylists to keep them discrete. On BMWs they’re placed in a corner of one of the two kidney grills; on Audis, they’re nestled into one of the logo rings. While the system is sufficiently expensive at the moment that it’s only been contracted by luxury car makers, Klapper said to expect Night Vision to appear in mid-level vehicles by 2016. To see the system in action, Autoliv’s general manager Richard Seoane took The Santa Barbara Independent on a test drive around the office’s parking lot where a life-size, heated deer had been set up in one of its far corners. Sure enough, as Seoane approached from the opposite side of the lot, the video display showed a perfectly yellow-highlighted image of the deer surrounded by the cool, dark shapes of trees and buildings. 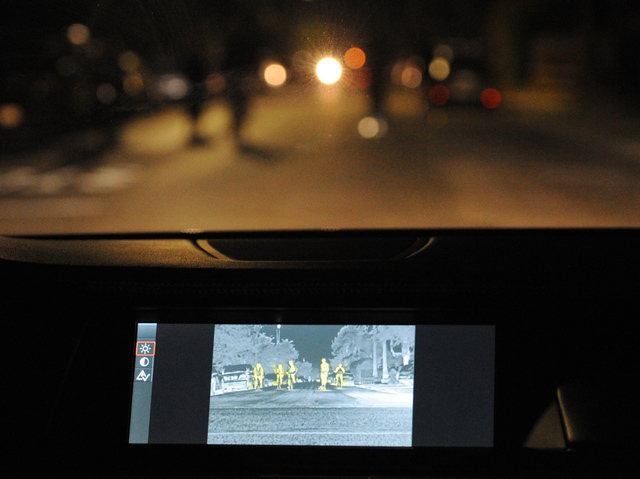 To get an even better sense of how Night Vision works on the open road, we headed to the busy streets of Isla Vista where roving packs of college students on foot, bikes, and skateboards — and famously oblivious to traffic — were spotted from impressive distances. Seoane explained that drivers shouldn’t keep their eyes glued to the screen as they travel, but instead treat the readout like a rearview mirror they periodically glance at. Technology that will allow the camera footage to display straight onto the windshield is not far off from entering the commercial market, he noted. 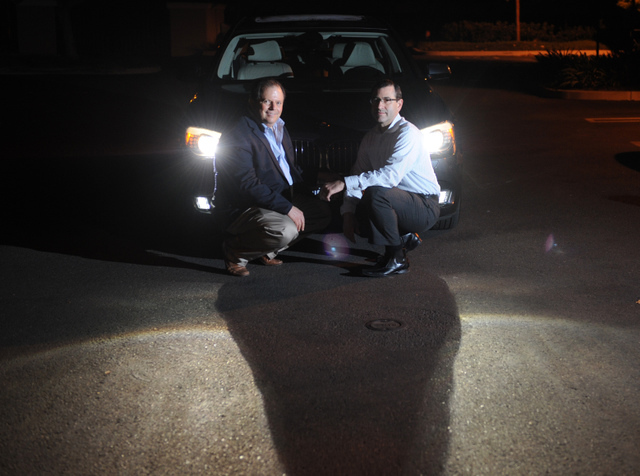 We also got a firsthand look at Autoliv’s new Dynamic Light Spot, a beam of light that locks onto and tracks a moving animal or person as they get close to the front of the car. Fitted on both sides of the vehicle where the fog lights would normally be, the rectangular LED lamp keeps a consistent beam when shined on a human but strobes when it hits an animal to avoid a “deer caught in the headlights” scenario. Seoane talked about the obvious concern of startling pedestrians with the Dynamic Light Spot, but explained that because it only flashes on a person from the waist down, people don’t seem to notice they’re being lit up. Indeed, after illuminating more than two dozen Isla Vista walkers and bikers, not a single individual showed a flicker of recognition. 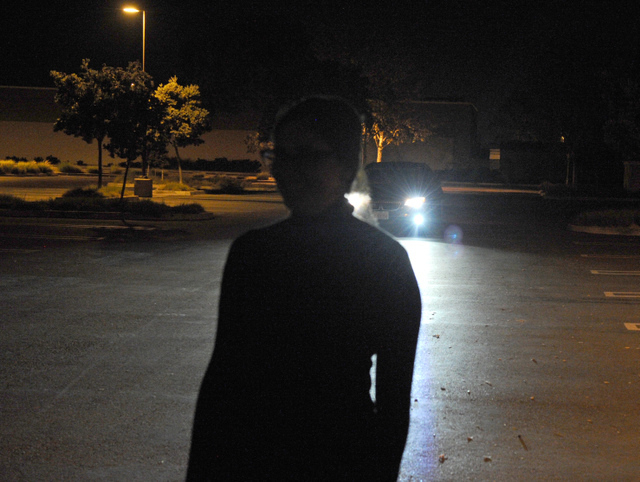 When he tested it on this reporter, the effect was akin to bright headlights. However, due to 45-year-old Department of Transportation laws governing lights on the roadways, the Dynamic Light Spot isn’t sold in the U.S. yet. It’s gaining popularity overseas, Seoane said, and Autoliv representatives recently traveled to Washington D.C. to discuss possible updates to the regulations.